Dario Saric scored 25 points on 9-of-11 shooting for Philadelphia, which committed a season-worst 26 turnovers while losing for just the third time in 12 games. Joel Embiid had 19 points and eight rebounds, JJ Redick added 17 points and Ben Simmons recorded 12 points and 15 assists for the 76ers, who shot 55.7 percent from the field. The 76ers opened up the third quarter with a 9-2 run to take an 81-62 lead before the momentum quickly changed as it committed nine turnovers in the stanza. The Bucks used a 10-2 surge to cut their deficit to 11 before Saric drained a 3-pointer to give the 76ers an 86-72 lead with 6:32 left. Philadelphia wouldn't score again in the quarter as Milwaukee rattled off 21 straight points. Bledsoe's driving hoop with 2:07 remaining gave the Bucks their first lead of the game and Antetokounmpo followed with three straight baskets to end the quarter to give Milwaukee a 93-86 lead. Embiid began the fourth quarter with a basket to end the 76ers' scoring drought at six minutes, 59 seconds, and Redick followed with a 3-pointer. Parker responded with five points during Milwaukee's ensuing 7-0 run to boost its lead to 100-91 with 9:36 left. 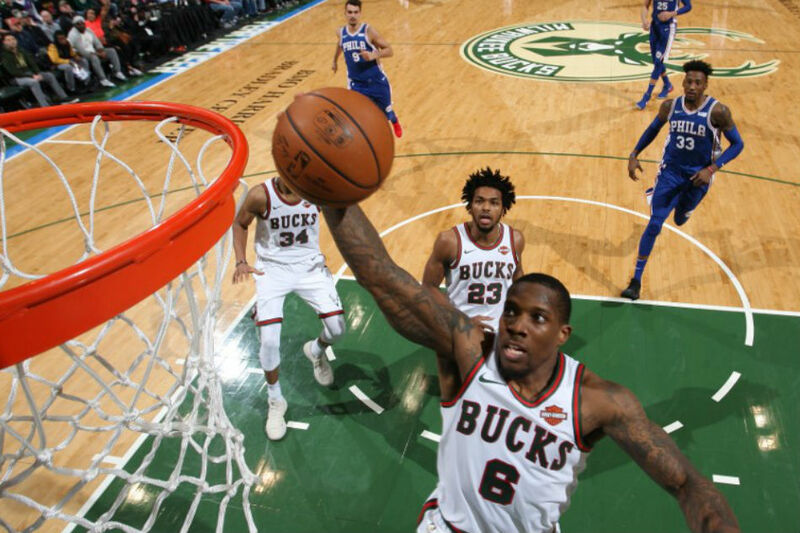 A three-point play by Zeller and a jumper by Bledsoe capped a 10-0 spurt as the Bucks took a 112-98 advantage with 5:25 remaining and cruised to the finish. The 76ers shot a blazing 66.7 percent from the field while possessing a 72-60 halftime advantage. Philadelphia made 16 of 21 field-goal attempts in the opening quarter and led by as many as 20 before settling for a 43-31 advantage. Milwaukee caught the 76ers at 51 on Henson's three-point play with 6:09 remaining in the half.